Winner of the 'nutrition award' from Asian institute of gastroenterology, Rujuta is among the most qualified and sought after sports science and nutrition expert in the country and the only nutritionist to have associate membership from sports dietitians, Australia. In the plethora of diet fads and fears, her voice rings loud and clear, urging us to use our common sense and un-complicate the act of eating. Having worked with people from all walks of life, of all age groups and varying fitness levels she has fine-tuned her methods to fit the lifestyle of the urban Indian. Her two books and the film 'Indian food wisdom' have been on top of the best selling charts for more than 5 years now. 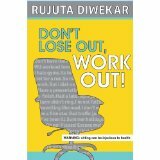 Her 3rd book on exercise 'don't lose out, work out' is out in the market now. Winner of 'Nutrition award' from Asian institute of Gastroenterology, Hyderabad. Voted as the '50 most powerful people in India' by People magazine, in their September 2012 issue. Among the only 3 Indians in the CNN Asia-Hot list: 'People to watch out for'. The India today magazine voted her in there 'Under 35 achievers of India'and the 'Change makers of Mumbai' lists. Voted among the '50 power women' in the annual list compiled by VERVE magazine. Awarded the 'Women achiever of the year' by Rado. Sadhna intensive and Teacher training courses from Sivananda Yoga Vedanta academy, Uttarkashi. CLIENTELE : In a career spanning more than a decade, Rujuta has worked with clients from all walks of life, from businessmen to homemakers, students, celebrities and sportsmen. 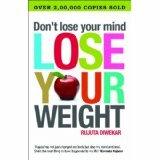 Rujuta's connect with the audience, as evident through her conversational style in her books, and her ability to demystify nutrition and exercise sciences has made her one of the most sought after speaker in her field. From hour-long talks to full day sessions, she has conducted workshops in india and abroad for corporates, clubs, fund-raisers, indian embassies, police force, sports camps, schools and colleges. FITNESS FUNDAS: A talk on the fundamentals of fitness followed by Q&A session.Rujuta shares the most pertinent tips for getting fitter. The advice is succinct and practical and topics can be tweaked based on your requirements. Duration: 1.5 hours. PLANNING YOUR OWN MEALS:An intensive workshop followed by customized meal planning exercise.Rujuta talks in detail about the nutrition, exercise, sleep and relationship strategies for a healthier way of life. She then takes you through an exercise wherein you get to plan your customized meals. Duration: 2.5 hours. WORKOUT PAATHSHALA: A workshop on the theory and technique of exercise. Based on her 3rd book this workshop is designed to give you the necessary understanding of why and how to workout - covering strength training and also running and Yoga techniques. 1 hour for exercise theory + 1 hour practical on planning your exercise schedule) Duration: 2 hours. WELLNESS @ WORK: A workshop for employees of an organization + inputs on food menu and workouts at the workplace. Designed specifically for organizations, the workshop tackles health issues and occupational hazards faced by the employees and how best to work around them and to plan your meals and exercise based on your office timings. 1 month follow up with Rujuta's team for office menu and workout planning.